Reproduced with permission from March/April 2016 South Dakota Conservation Digest, Department of Game, Fish and Parks and the Authors. The CCC Museum of South Dakota appreciates the article and are pleased to share it with our visitors. On July 1, 1919, thanks to the driving force of Governor Peter Norbeck, the former Custer State Forest became Custer State Park (CSP). The first of South Dakota's 13 state parks, Custer continues to reign as the crown jewel atop the state's park system. It is known for its breathtaking scenic drives, abundant wildlife and unique geological wonders. Ironically, amidst all the majestic natural wonders, much of the iconic architecture found in the park was designed to fade quietly into the landscape, allowing Mother Nature to shine in all her glory. 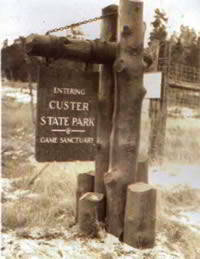 As Custer State Park rapidly approaches its 100th anniversary, historians continue to document the many changes that have taken place within the park over the years-the addition of more land, the construction of roads and dams, even the ebbs and flows in types and numbers of flora and fauna. However, throughout the passage of time, park management has always continued to strive to keep the architecture true to the history of the area. Some early structures were constructed by others before the park was created and were purchased by the park along with the land beneath them. The original Sylvan Lake Lodge, destroyed by fire in 1935, is a prime example of the structures that came with the land. Others, like the Game Lodge, were built specifically for the park. The existing structure is actually the second version, as the first structure, completed in August, 1921, promptly burned to the ground two months later. 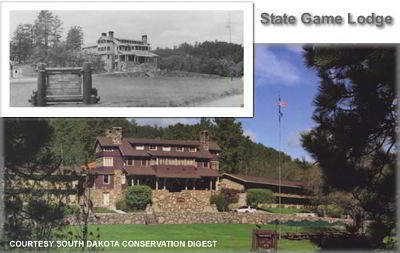 The current Game Lodge was constructed shortly thereafter and went into use in June 1922. In the late 1920s, President Calvin Coolidge spurred a small flurry of construction in the park, when he made the Game Lodge his Summer White House. Even in those days, the President was followed by an entourage of staff, reporters and curious onlookers, requiring the construction of what are now the present-day Coolidge Inn General Store and Gift Shop, to accommodate the Presidential following. The construction of Blue Bell Lodge and Valhalla, Peter Norbeck's private home, soon followed. As with many exceptional public projects throughout the country, Custer State Park owes much of its prodigious architecture and infrastructure to the work of the Civilian Conservation Corps (CCC) in the 1930s and early 40s. It is amazing to consider that out of a time of such strife across our country, so many enduring projects were constructed. In addition to performing fire suppression and laying out camping and picnic grounds, CCC infrastructure contributions in Custer State Park include not only bridges and roads, but the construction of Legion, Stockade, Center and Horse Thief dams. The most indelible CCC mark left on the park, however, is the phenomenal architecture and structures, many of which are still in use today. With the exception of the previously mentioned lodges, many of the buildings we see in Custer State Park were built by the CCC. Most notable of these buildings are the Peter Norbeck Visitor Center and the Wildlife Station Visitor Center. Although originally built as the buffalo herdsman's house, the Wildlife Station Visitor Center displays many of the craftsmanship styles unique to the CCC. The historic Mount Coolidge fire tower, still used today and built on one of the park's highest points, was one of the last projects completed by the CCC in the late 1930s. 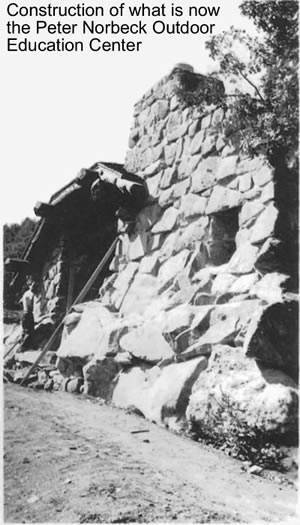 When building at the park, the CCC used as much native stone and lumber as possible. In addition to these materials being readily available, it was also their goal to allow the buildings to blend in with the natural environment and not distract from the beauty of Custer State Park. >> Renovation of motel wing rooms and the historic facade of the State Game Lodge: As previously mentioned, the existing lodge was completed in 1922. The motel wings, while not part of the original Game Lodge construction, require updating to allow them to better reflect the facility's architecture and serve the public. >> Replacement of 14 cabins and renovation of 59 cabins: The log cabins, which are being renovated, were originally built by the CCC. The lapsided cabins, which are being replaced, were originally built by park staff and have exceeded their expected life span. >> Replacement of the Legion Lake Lodge building: Due to the age of this 1940s structure and the way it was built (with logs laid on the ground as the foundation) the building started to rot away from the inside out. The new lodge will offer enhanced views of Legion Lake. >> Construction of three new reunion cabins and one honeymoon cabin. Although new construction, these structures located at the Game Lodge, Blue Bell and Sylvan Lake Resorts will respect the existing architecture in the park, while providing expanded, modern facilities. Over the years, park maintenance staff has taken the time to learn about and preserve as many of these buildings as possible. Likewise, as new buildings are constructed in the park, designers are asked to mimic the old log and stone design of the CCC, in order to keep the theme of that architectural style alive. Visitors to the park this year will witness the continuing commitment to this architectural theme in the design of the new Custer State Park Visitor Center and other Custer State Park Resort improvements. With an estimated 1.8 million annual visitors and a land mass 71,000 acres, Custer State Park is not only the most visited state park in South Dakota, but also one of its largest attractions. Although an incredible and enduring structure, the park's Peter Norbeck Visitor Center, built by the CCC in 1934, was not designed to introduce this many visitors to the park. In response to the need for expanded facilities, the park broke ground in 2015 on the new Custer State Park Visitor Center. This modern, expanded facility, located near the Wildlife Loop, will not only increase visitors' exposure to and understanding of the park's facilities and history, but will also open doors to the recreational opportunities of South Dakota's Black Hills region. Similar to its predecessor, the new visitor center uses the familiar stone and log construction in blending with the natural beauty of the park. When the new visitor center is complete, the Peter Norbeck Visitor Center will be repurposed into an outdoor education center. The center will be aimed largely toward families, school groups and visitors coming to the park to take part in interpretive programs and activities. Although the hammering, sawing and general racket associated with the new construction and renovation activities may drown out the day-to-day preservation activities, rest assured the staff at Custer State Park is hard at work maintaining the park's architectural treasures. Several of the park's structures, including the Game Lodge; the Peter Norbeck Visitor Center; Badger Clark's home, The Badger Hole; and Peter Norbeck's Summer Home, Valhalla, are found on the National Register of Historic Places. Preserving these buildings and the architecture they represent, blends the past with the present, and continues to be a high priority for both the State of South Dakota and Custer State Park. 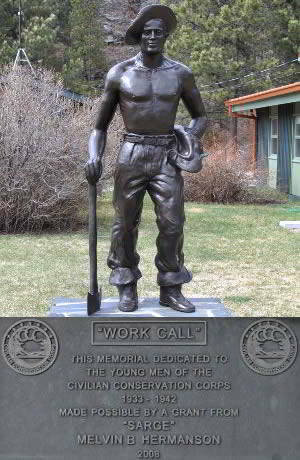 << The Civilian Conservation Corps (CCC) is responsible for much of the infrastructure in Custer State Park.